In Hear This, The A.V. Club writers sing the praises of songs they know well. This week, we’re picking songs about specific states. As Brie Larson gave her acceptance speech after winning the Best Actress Oscar for Room, the camera panned to her beaming boyfriend, Alex Greenwald, who she lovingly name-checked in her remarks. I’m not sure under what rock I was living, but I had no idea Larson was dating Alex Greenwald, a.k.a. the lead singer of Phantom Planet. 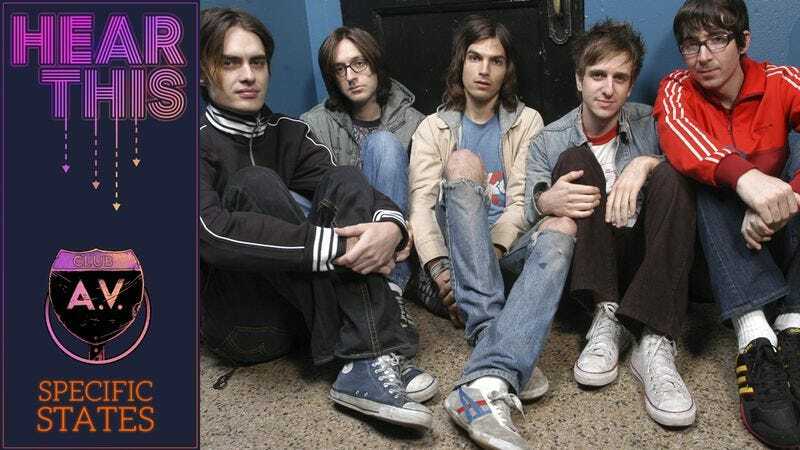 Although he’s created plenty of music since that band went on an indefinite hiatus—though he’s currently in the synthpop throwback act Phases—he will forever in my mind be associated with Phantom Planet. In fact, upon realizing who he was, the group’s signature song “California” immediately popped into my head. It’s easy to see why “California” was used as the theme for The O.C. (R.I.P.). First and foremost, it’s an expertly paced, Weezer-esque tune that manages to be both poppy and kind of gritty, which matched the show’s specific brand of drama. And while the song’s lyrics are certainly homesick for things such as the 101, their optimism is tempered by weariness and even uncertainty. The “California” protagonists are clearly relieved to be heading back to the state after time away—but it’s unclear whether going “right back where we started from” is a good thing, or whether they’re going to be walking back into a completely unfamiliar situation (or a minefield). Accordingly, the song’s insidiously catchy, recurring piano melody is also simultaneously hopeful and melancholy—and by the end of “California,” when Greenwald’s delicate emoting gives way to a vocal freakout of him screaming, “California, California—here we come!” the song feels more like a threat than a promise. In other words, perhaps going home again is more fraught than Phantom Planet initially anticipated.